Helpful and friendly staff, Tao restaurant is great! Staff was friendly and helpful. Kareem at the Branzino was super. Overall it’s a good experience. The Hotel is nice, rooms are specious and clean with good views. Good food is served and nice sitting areas within the hotel. It is a resort type hotel. The staff was either really great or really inconsistent. 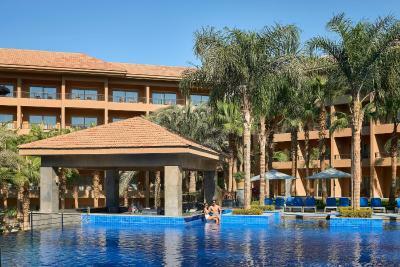 Dusit Thani LakeView Cairo This rating is a reflection of how the property compares to the industry standard when it comes to price, facilities and services available. It's based on a self-evaluation by the property. Use this rating to help choose your stay! 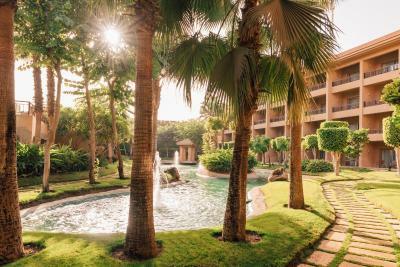 Set in a resort style, Dusit Thani has a green setting with waterfalls, broad tree-line streets, lakes and a stream giving the place a unique feel.This stylish and contemporary 5-star hotel, located in New Cairo, offers luxurious accommodations. It features 2 outdoor pools, a hot tub, 5 restaurants and 2 bars. Each room is fitted with a flat-screen TV with satellite channels. Certain units include a seating area to relax in after a busy day. All rooms include a private bathroom. For your comfort, you will find bathrobes, slippers and free toiletries. 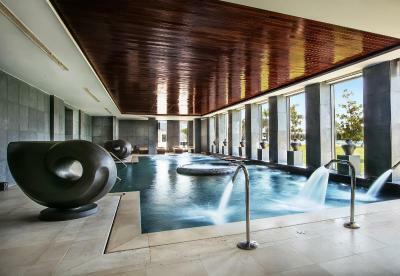 You also enjoy the wide selection of fitness, spa and swimming facilities. 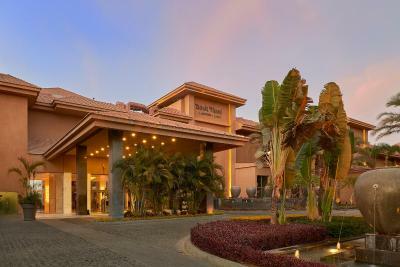 The hotel has 17 function rooms with a business center and pre-function foyer. It also has a lake view ballroom. Located on the kids pool area, the Dusit Junior Club offers daily entertainment programs from handcrafts to face painting to a fully equipped play station ground and a dedicated area for toddlers. Guests can enjoy a multi Asian style menu at TAO which feature an impressively varied menu reflecting the best of Chinese, Indian, & Japanese cuisine all run by native chefs, meant to fuel its guests and invigorate their senses. American University in Cairo, New Cairo Campus is 2.6 mi from Dusit Thani Cairo, while Mobarak Academy is 3.1 mi away. Cairo International Airport is 6.8 mi from the property. Airport transfer can be organized for you to the hotel. 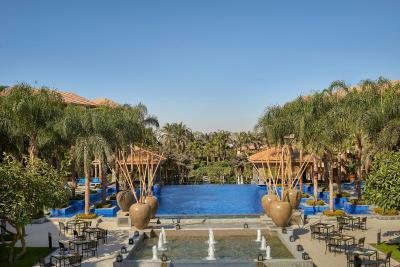 When would you like to stay at Dusit Thani LakeView Cairo? This room features a balcony, satellite TV, and mini-bar. This comfortably designed Dusit Suite offers free WiFi, balcony and a living room. •	Press Reader website is provided complimentary with wide selection of daily international & local newspapers and magazines with various languages. •	Complimentary tea, coffee, juices and soft drinks are available at the lounge from 07:00 to 23:00. •	Children are welcomed with their parents into the lounge throughout breakfast time and up till 12:00 noon only. •	Complimentary cocktails with canapés are served daily from 17:30 to 20:00 at the lounge (your visitors will be charged as per consumption). •	Fresh fruits in room upon arrival. •	Complimentary Internet access for your comfort in your room. •	Unlimited free wireless and high speed Internet access at the lounge. •	Complimentary use of the lounge board room for 2 hours per day (pre booking and subject to availability). •	Complimentary pressing service for three items upon arrival and 20% discount on laundry for duration of stay. •	Complimentary local land line calls in your room. •	Complimentary late check-out till 16:00 (subject to availability). All executive suites have a separate bedroom, living room, large dining area, and spacious marble bathrooms with a separate shower and tub. This room is more spacious and offers high-speed internet access and an oversize writing desk. Please note that children are allowed to enter the Club Lounge till 12:00 noon. All rooms have a spacious terrace on the pool level for direct pool access and a full day relaxation experience. 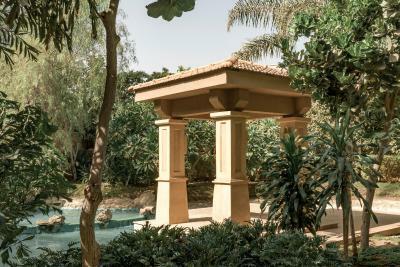 Dusit Thani LakeView Cairo is an oasis of greenery and lakes in the heart of New Cairo, a newly developed satellite city in the Egyptian capital. Infused with traditional Thai design and offering genuine Thai hospitality, Dusit Thani brings a taste of Thailand to the centre of Egypt. This 5-star hotel is strategically located in New Cairo’s Fifth Settlement, only 20 minutes from Cairo International Airport and in close proximity to the main roads that lead to Cairo’s major attractions, including the Pyramids, Sphinx, Citadel and Egyptian Museum. 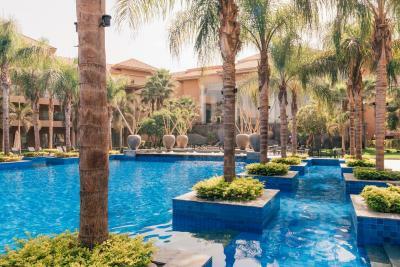 At Dusit Thani, guests are welcomed by the largest rooms and suites in greater Cairo, three outdoor swimming pools, a Jacuzzi, a well-equipped fitness centre and an array of fine dining options spanning a world of tastes and flavours. For those looking to unwind, head to Devarana Spa (opening soon) adjacent to Dusit Thani, featuring contemporary Thai design and décor, where guests can soothe their bodies and minds with signature treatments that fuse East and West. House Rules Dusit Thani LakeView Cairo takes special requests – add in the next step! Any additional older children or adults are charged USD 68.36 per night for extra beds. 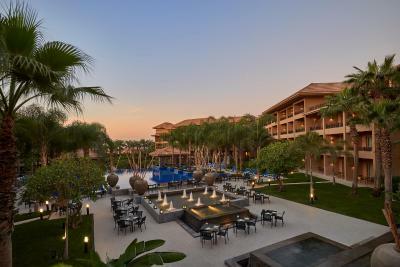 Dusit Thani LakeView Cairo accepts these cards and reserves the right to temporarily hold an amount prior to arrival. Please note that for prepaid bookings guests must present the credit card that was used to make the reservation with upon check-in. If the card is a third party card, guests will be requested to provide a scanned front and back copy of the card used, the credit card holder passport and an authorization letter for the hotel to charge the exact amount. The breakfast was very overcrowded and wasn’t being stocked up or refilled at all, however Ahmed on the omelet station was very friendly and helpful. Ghada on reception was very rude. The Thai restaurant was amazing, and Ahmed on the omelet station at breakfast was very accommodating. Khaled Gamal one of the managers was also very helpful. The rooms were really nice, although towels and robes were missing on check in and so we rang reception to get these sent to the room which took over 2 hours to come. Value for money is okay but not great. Location and free drinks in the mini bar. Room not clean enough - greasy marks on glass barrier in shower, marks in bathtub. Cigarette butts on a terrace. Chairs on terrace dusty and one of them damaged... I really think this should not be acceptable in a hotel of such category. Bed was comfortable. Breakfast was quite average, but with very nice environment. The Lake is no more than a swimming pool! !